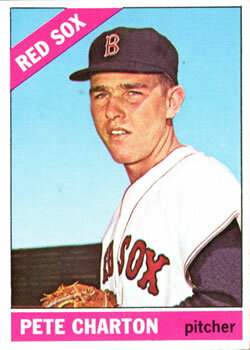 Pete Charton’s time in the big leagues was brief; he pitched in 25 games for the Boston Red Sox in 1964. It hadn’t taken him long to get there, having worked just one season in the minors beforehand. He showed considerable promise, but professional baseball did not hold the attraction he had hoped for. Before long he pursued other directions in life as a college professor and, ultimately, author of the 2012 book Off to College with King Solomon: A Devotional Handbook for Beginning College Students. Pete was born as Frank Lane Charton on December 21, 1942, in Jackson, Tennessee, the county seat of Madison County, about 70 miles east of Memphis, located on what is now I-40 between Memphis and Nashville. It’s the seventh-largest city in the state and had a population of about 25,000 at the time of Pete’s birth. Though he was a right-handed pitcher, Charton batted from the left side. He stood 6-feet-2 and was listed at 190 pounds. His interest in baseball started at a very early age, prompted by his father. “My dad was Frank G. and I’m Frank L. And my mother was Iris Dean Lane. And Lane is my middle name. She was a Texan and Dad was an Okie. “I was extremely fortunate because both of my parents were just wonderful people. They were gifted intellectually. They came up the hard way. Neither one of them had two cents to rub together when they were growing up. To earn his way through college in Oklahoma, my dad for several years slept under the shelves of a counter in a fried pie shop. He got up every morning about 4 o’clock to fire up the stoves. They both had to earn what they had. Consequently, as is typical of that generation, they didn’t have a lot of patience with bellyaching or making excuses. I had great parents. And Pete’s mother was an achiever, too. First, raising three children, then forging some paths of her own. “My mother went back to school when I was a sophomore in high school, because she didn’t know how they were going to pay for my college. Fortunately, I got an athletic/academic scholarship to Baylor, so my college days didn’t really cost them much. But she didn’t know that at the time, so she went back and started teaching. First grade was probably the first thing she taught. She ended up teaching everything from kindergarten through high school in Nashville. As she was doing that, she continued to go to graduate school and got her degrees. Once she did that, she became a college professor at Belmont University. Her field was English literature and early childhood reading. She set up the first privately run classes for children’s reading in the State of Tennessee. She was very well thought-of across the state. She wasn’t teaching at the private school all the time, but she set it up and watched over it. After starring in high-school ball and being named MVP in 1960 (he was also president of the National Honor Society at his high school), Charton attended Baylor. In his sophomore year, in the spring of 1962, Charton threw a three-hitter, a two-hitter, and then a five-hitter for the Baylor Bears, with an 8-2 record and selection to the All-Southwest Conference team.10 He earned an offer from Boston Red Sox scout George Digby. On July 3, he signed with the Sox for an amount thought to be in excess of $8,000 (the actual amount was never publicly revealed).11 He was to report in the spring of 1963. As it happens, he got in some work late in 1962 pitching in the Florida Instructional League. The Red Sox assigned him to their affiliate in the Single-A Carolina League, the Winston-Salem Red Sox. The team finished 17 ½ games out of first place in its division, but Charton finished with an earned run average of 3.07 and a record of 8-10 in 170 innings of work. He struck out 176 batters, more than one per inning. He returned to Florida Instructional League ball that winter. It must be a nice feeling for a kid like Tony Conigliaro of Swampscott to go to spring training in February and know that no matter what he shows he will stick with the Red Sox next season. Under the rules of baseball, such is the case. Two other youngsters — pitchers David Gray and Pete Charton — also will stick with the team. None of them is ready for the major leagues, but they’ll be there anyway. The rule that creates the situation is the so-called “first year rule” which forces the Red Sox to keep their first year players on the 25-man roster or risk losing them for only $8,000 on waivers which cannot be withdrawn. The rule obviously hurt player development and handicapped teams, so was shortly dispensed with. But Charton did indeed spend the entire season with the Boston club. Manager Johnny Pesky could only hope to get something out of the first-year bonus rule players on the roster. He got more than almost anyone would have expected out of Conigliaro, including 24 home runs and a .290 batting average. And Pesky may have used Charton more than intended — he was used in 25 games and threw 65 innings. He wasn’t used much at first — two innings of relief on April 19 and 1 ½ innings on May 10. He was tagged for two runs the first time out, and (after retiring the first three batters) three more runs in his second appearance. His once-a-month work improved to three calls in June and five in July, all closing games — though all were in games the Red Sox were already losing. Some of the Red Sox players took him aside to give him pointers. “The person that I probably appreciated the most was Bill Monbouquette. For some reason he took a liking to me. He grabbed me by the shirt collar one of the first days of the season. He sat me down and wouldn’t let me move until we faced every team and pitched to every hitter, and that kind of thing. With the Sox clearly out of contention, Pesky gave Charton more work in August, calling on him nine times. Over the course of the month, he brought his ERA down from 10.43 to 7.34. He was employed six times in September. As it happens, the Red Sox lost each of the first 22 games in which Charton appeared. Charton’s second start was against the Angels at Fenway Park five days later. He gave up only four hits and one run in seven innings. The score was tied, 1-1, when he departed. Heffner lost that one, too, also in extra innings. Finally, in his 23rd appearance for the Red Sox, Charton saw his team win the game in which he had pitched. He started against the visiting Minnesota Twins on September 18 and gave up four runs in 4 2/3 innings. The Red Sox were leading, 6-4, when he was relieved, and went on to win the game, but he was one out short of being the pitcher of record, not having completed the first five. Charton had two more starts and in them received his first two decisions. In neither game did his team score even one run — a 1-0 loss to the Washington Senators on September 23 and a 5-0 loss on September 30 to Cleveland. Only two runners had even reached second base in the game on the 23rd, but one of the two scored and that was the ballgame. Charton finished the year with a record of 0-2 (5.26). The Red Sox finished in eighth place, 27 games out of first place. And Johnny Pesky finished out of a job, replaced by Billy Herman when only two games remained on the schedule. It really had been a lost year in terms of development, but he’d learned as best he could and he’d gotten a good taste of the majors. Near the end of spring training in 1966, with a recurrence of his shoulder issue, he was optioned to Toronto. Before the end of April, however, he was sent back home to Nashville to undergo medical treatment. This also allowed him to continue course work he had been taking at George Peabody College. Beginning in early June, again he was forced to sit out baseball for the rest of the year. In November, it still not having cleared up, he underwent surgery for the removal of calcium deposis in his shoulder. “Then I drove over to Boston from there. I had a meeting with several of the front office and told them that I was just going to hang it up because the shoulder was hurting so much; I was afraid I was going to have to have surgery again. I just didn’t want to do that. “I’ve had a lot of trouble with the shoulder ever since. If I don’t exercise religiously and lift weights with it, it does give me some problems. Even today. When the Boston team added Ken Harrelson for the stretch drive that year, they needed to clear a roster spot and so released Charton outright to Pittsfield. Were he able to do anything differently about his baseball career, Charton told Andrew Martin, “I would have been a catcher rather than a pitcher. I think I would have made a good catcher. I did some catching when I was growing up; not a whole lot because I had to be either on the mound or the infield. I think that being a catcher is about the fastest way to the major leagues. You can play there the longest if you’re a good defensive catcher and hit .250. “Pitching was alright in the minors, but you didn’t get to hit and you played once out of every four or five days. I was just always wanting to play every day and would have taken a position where I could have been an everyday ball player.21 I did pinch hit regularly in the minor leagues, and after the shoulder surgery and retirement from baseball I was offered a Red Sox contract in the minors as a hitter/ position player, but I opted to stay in graduate school instead." “I studied physical geography. That was the department that I was in. But as one of my bosses told me, “I’ve never seen a resume that had this much variety in it.” I actually came out of school as a meteorologist. I had a minor in soil science. And I had almost a minor in botany. I had a whole bunch of geology in there; I actually ended up teaching geology most of my college career. After working as a teaching assistant while finishing his degrees at Michigan State, Charton taught for a couple of years at the University of Illinois. He fully appreciated the university, but felt something of an additional calling. While at Michigan State, he’d met his future wife, Sylvia, in the small Eastern Tennessee city of LaFollette. Sylvia herself graduated with honors from Michigan State. She did some substitute teaching, but concentrated on being a homemaker and raising a family. And in time, they moved from Champaign, Illinois, back to the mountains of East Tennessee to the town of Harriman — near Oak Ridge, west of Knoxville, where he took a position at a new community college being set up in the region, Roane State Community College. He hadn’t really expected to stay at the community college but figured he’d teach there for a couple of years, and then he would move to Oak Ridge where there was always a need for scientists. He taught at Roane State for 35 years. Pete and Sylvia have three children. Katie, the second-born, “always wanted to minister to disadvantaged, hurting people.” She first worked with elementary school children, kids who didn’t have English as their first language -- English Speakers of Other Languages (ESOL). She helps them understand what’s going on. She has done that for a large number of different language speakers. She has helped so many kids and sometimes assisted frightened parents. She’s helped kids find out they need glasses or this and that, and in some cases she has learned if they’ve been abused at home. I don’t know how she does it. “In the last couple of years, she has largely stepped out of her ESOL role and is teaching seventh grade social studies. She and her husband have three sons. “Ross, our oldest, is a Lieutenant Colonel. He lives in Georgia. Now out of active duty, he serves in the Army Reserve. Most of his work is done in Huntsville, Alabama. He has two daughters and a step-son. “Kristi, our youngest, lives just outside of Sevierville, Tennessee. She teaches high school math there, where she, too, has helped so many students cope with life difficulties. Her college football-coach husband and 2 years-old daughter keep her (and us) on the go." In addition to the sources noted in this biography, the author also accessed Charton’s player file and player questionnaire from the National Baseball Hall of Fame, the Encyclopedia of Minor League Baseball, Retrosheet.org, and Baseball-Reference.com. Thanks to Eric Manning. 1 Author interview with Pete Charton, November 7, 2017. 3 Author interview with Pete Charton, November 7, 2017. 10 Associated Press, “Charton Signs Pact With Bosox,” Times-Picayune (New Orleans), July 4, 1962: 13. 12 Larry Claflin, “1st year Rule Handcuffs Sox,” Boston Record American, December 22, 1983: 20. 14 Tom Monahan, “Charton to Get More Work,” Boston Traveler, September 8, 1964: 44. 16 Larry Claflin, “Charton Fights Woes to Stick With Red Sox,” The Sporting News, April 2, 1966: 12. 18 Jack McCarthy, “Charton Fans’ Reward Near,” Boston Herald, March 6, 1966: 71. 22 Will McDonough, “Back Injury Nearly Finished Charton,” Boston Globe, March 6, 1966: 58. 25 Dr. Pete Charton, Off to College with King Solomon: A Devotional Handbook for Beginning College Students (Self-published, 2008, rev. 2012), 42. 30 The last section is drawn both from Dr. Charton’s book and the November 2017 interview.